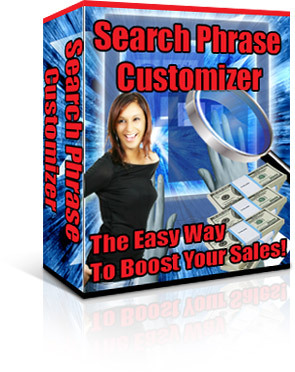 Search Phrase Customizer | The Easy Way To Boost Your Sales! "Boost Your Sales Automatically By Showing Your Search Engine Visitors, Exactly What They Are Looking For!" As you probably know, getting visitors to your site from the search engines is one of the best ways to generate traffic and sales. You can get free traffic from the search engines or pay for it through pay-per-click. The drawback with search engines is that your link is shown alongside so many others. A typical visitor will click each link, take a quick look at the website and if it does not immediately appear to address their particular requirement, they'll click the Back button and try a different link. This means that when you receive a visitor from a search engine, you have just a few seconds to convince them that your site addresses their need. Visitors will typically do little more than read the top line of your page to decide whether it provides information or products that they are looking for. This means that many visitors will decide that your site is unsuitable and leave, even if the site does actually provide the information or products that they wanted! This means lost business from free search engine traffic and wasted money for pay-per-click traffic. To illustrate this problem further, here's an example. John's website sells a book providing general financial guidance on a variety of common areas. A visitor is searching specifically for "mortgage advice". John's book includes mortgage advice, so the search engine has included his site. His web page shows the headline at the top of the page as "Financial Guidance For Everyone". A visitor seeing this decides that this doesn't match what he's looking for and leaves the site, even though John's book did include the information he was looking for. Now consider what would happen if John's headline was "Looking For Mortgage Advice?". Since this exactly matches what the visitor was looking for, he is much more interested in John's site and takes the time to read John's web page. As a result John has the chance to make a sale. This example illustrates the power of making your web page look immediately relevant to visitors from search engines. In this example, the rest of John's page is not altered in any way. The only difference is the headline. Obviously if John's book isn't relevant then he will not get a sale (although in this case, the search engine should not have found John's page in the first place). Assuming John's book is relevant, he is much more likely to get a sale from someone looking specifically for mortgage advice, simply because they will take the time to read his web page. Tests have shown that having a headline that exactly matches what people are looking for can substantially increase your sales when getting traffic from the search engines. Search Phrase Customizer is a brand new, easy to use tool which helps you benefit from this fact automatically, by displaying a headline that exactly matches what the visitor is searching for. Above you'll see a screenshot of the software, which shows just how easy this software is to use. Before using the software, you must insert the text "ReplaceSearchPhrase" in your web page wherever you want the search phase to appear. In the example above, we'd set the headline of John's page to "Looking For ReplaceSearchPhrase?" Now run the software, click the Select File button and select your web page file. Enter the default text, which will be shown in place of "ReplaceSearchPhrase" when your page is not accessed directly from a search engine. In the example above, we'd set the default text to "Financial Advice", so anyone accessing the page directly (without going through a search engine) will see "Looking For Financial Advice?" The web page is instantly updated, ready to upload. Now if someone searches for "mortgage advice", the headline would be "Looking For Mortgage Advice?". Someone else searching for "credit assistance" would see "Looking For Credit Assistance?". Someone else searching for "tax calculations" would see "Looking For Tax Calculations?". Notice the way in which the headline is merely echoing what the user is looking for. The implication is that the web page contains information that is relevant (which hopefully it does if the search engine is any good). However the headline is actually simply showing the search phrase as a confirmation that that is what they are looking for. 1. The software will replace every instance of ReplaceSearchPhrase anywhere in your web page with the exact search phrase entered by the visitor. This means that you are not limited to only including the search term in the page headline. These options allow you to make the search phrase look more natural as part of your headline. This covers the vast majority of searches on the Internet, automatically picking up the search phrase entered by the user and inserting it into your web pages. 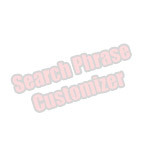 Your copy of Search Phrase Customizer comes complete with Master Resale Rights. For most online businesses, the search engines represent one of the most important sources of traffic and sales. Search Phrase Customizer helps keep more search engine visitors on your site by making your site look immediately more relevant to them. The software does all this with just a few mouse clicks, making the process incredibly quick and easy. I could charge a lot for this software given the enormous benefits that it could bring to your business, so I'm sure you'll be amazed when I tell you that you can get your own copy of this software, complete with Master Resale Rights for just $17. If at any time within the next 30 days, you decide that Search Phrase Customizer doesn't meet your needs, just send me a quick email and I guarantee to refund your money in full, no questions asked. Disclaimer Although tests have shown that using the solution implemented by this software results in more sales to visitors from the search engines, the actual results are dependent on many factors, including for example the quality of your sales page and the keywords being targeted. We are therefore unable to guarantee that you will benefit from using this software, although we will happily refund your money in full in the unlikely event that you do not see worthwhile returns on your investment.